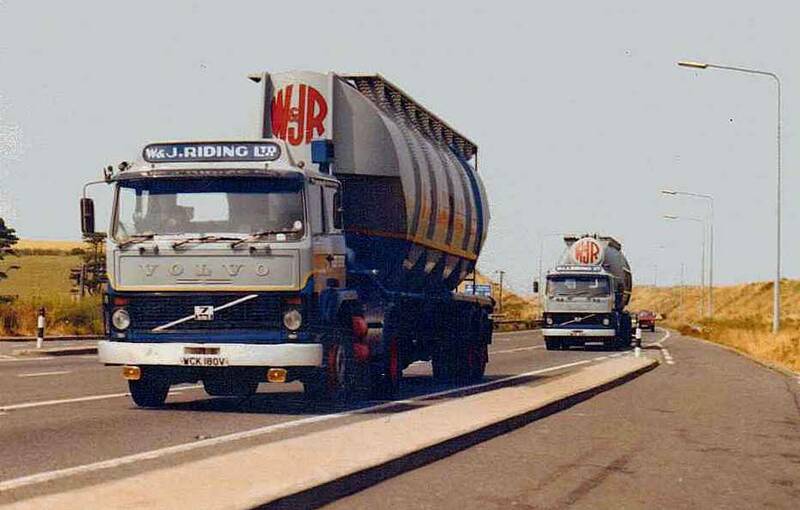 The company were looking for a lighter and quieter tractor unit than the Seddon Atkinson 400 before the Seddon Atkinson 401 had come out. 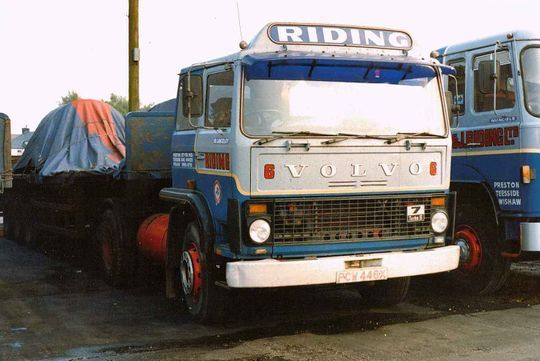 Tom Riding was offered a damaged Volvo F7 4x2 tractor unit from the well respected fleet of Bowker's which was soon followed by another one in a similar state. These were soon sorted out and put to work with tipping gears and Wellworthy WS 9 compressors. They did a good job and were trouble free and eventually the company bought two more from the same source. 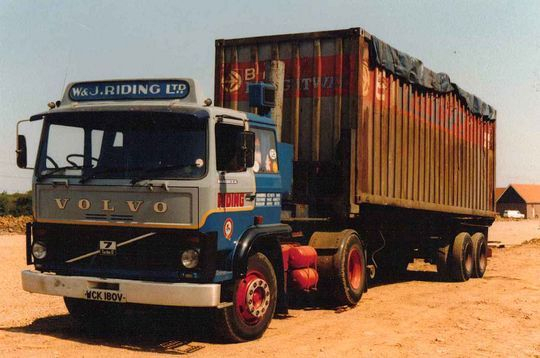 Mr Bill Bowker, when in conversation with Tom Riding, said he regarded the Volvo F7 as the modern replacement of the Atkinson Mk I. In other words they were durable cheap to run and maintain, he ought to know, because Bowker's had plenty of them in their fleet. A close up shot of the first Volvo to enter service with W & J Riding former Bowker Volvo F7 4x2 tractor unit Reg No WCK 180V Fleet No 68 'Boadicea'. Driven by Jim McColl it is pictured parked in the depot at Longridge after being in service with Riding's for a number of years. A pair of ex Bowker Volvo F7 4x2 tractor units head down Jubilee Way into Dover. At the front Reg No WCK 180V Fleet No 68 'Boadicea' which was driven by Jim McColl while taking up the rear Reg No WCK 26V Fleet No 69 'Hotspur' which was driven by Mick McKay. Both vehicles were on their way out empty to Belgium for a load of plastic pellets for delivery to a customer in St Neots on a job which went on continuously for two weeks. 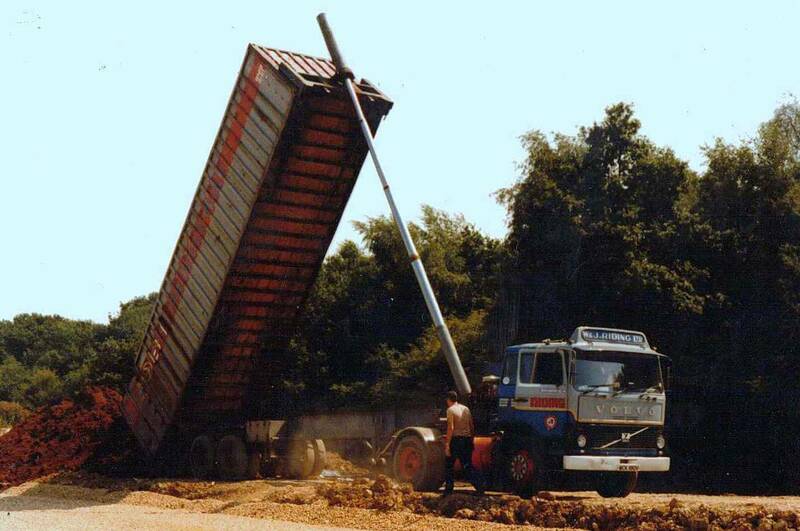 "This was an emergency spot hire job so under the circumstances we should have been well paid". 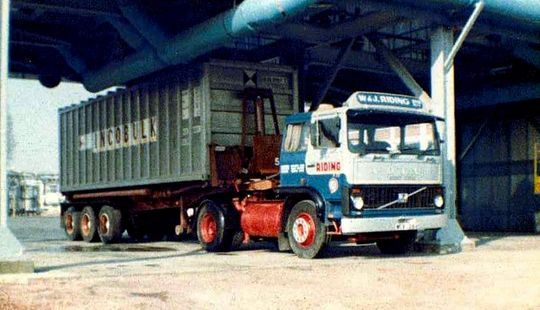 Volvo F7 4x2 tractor unit Reg No WCK 180V 'Boadicea', originally new to Bowkers on the 1st of November 1979, is seen here in 1983 working down in Middlesex during the construction of the M25. Over a period of a few weeks W & J Riding transported a load of peat per day from Ireland down to the M25 Holmesdale Tunnel construction site at Enfield. On top of the tunnel they recreated a village green, thus the need for a vast amount of peat to cover the large area. 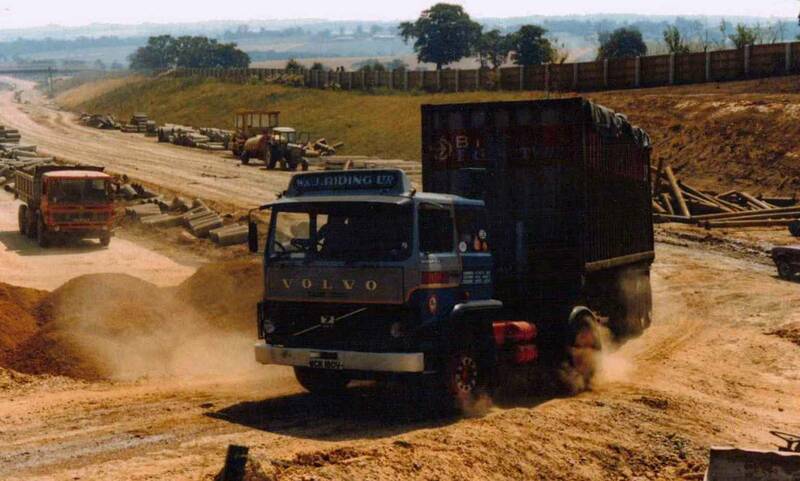 Another shot in a series of photographs showing Volvo F7 4x2 tractor unit Reg No WCK 180V 'Boadicea' as it arrives on site with a full load of peat during the construction of the M25 in 1983. Volvo F7 4x2 tractor unit Reg No WCK 180V 'Boadicea' driven by Vic Mason is pictured here tipping a load of peat during the building of The Holmesdale Tunnel, adjacent to Junction 25 of the M25 London orbital motorway. This was a tricky tip because we were not tipping on firm ground and we had to tip beyond 45 degrees to get the peat out". The Holmesdale Tunnel was opened in 1984 and whilst the structure remained sound, over the years it suffered from decaying and time-expired mechanical and electrical equipment. 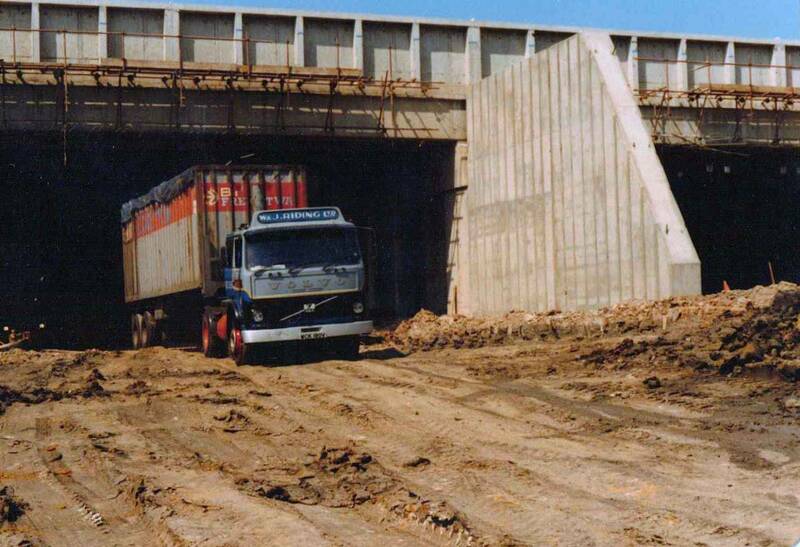 A major refurbishment of the tunnel began in May 2006 and was completed three months early in September 2007. The final photograph in the series shows Volvo F7 4x2 tractor unit Reg No WCK 180V 'Boadicea', driven by Vic Mason, coming out of the Holmesdale Tunnel during construction of the M25 orbital motorway in 1983. Volvo F7 4X2 tractor unit Reg No WCK 26V Fleet No 69 'Hotspur' was originally registered new to W H Bowker Ltd of Blackburn on the 1st of October 1979. Purchased second-hand from Bowker's on the 12th October 1982 when three years old for £11,000 plus vat it came to Riding's accident damaged which was easily repairable. On top of the original cost Tom Riding spent another £2,651 in house to bring it up to spec by fitting it with a blower and hydraulic pump. It was driven by Mick McKay, long time Riding's man, who took this photograph at the BP plant at Wingles in France. Mick was loading polystyrene for Gillette at Reading having taken a load of plastic pellets from BXL Grangemouth down to France on his way out. After five years in the fleet WCX 62V was eventually sold on to Snow Commercials of Bristol for £1,600 plus vat on the 10th of August 1987. 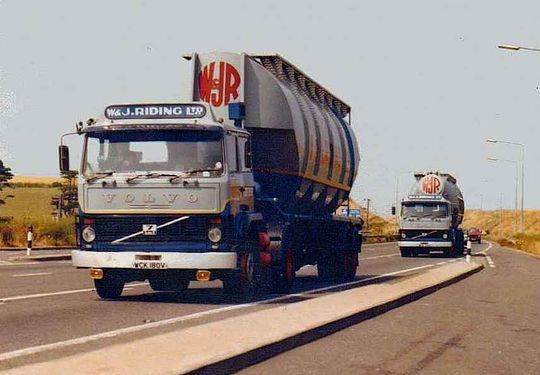 Another shot of Volvo F7 4X2 tractor unit Reg No WCK 26V Fleet No 69 'Hotspur' this time seen here coupled up to a tandem axle trailer with an Incobulk container discharging it's load of powder at Wrexham. 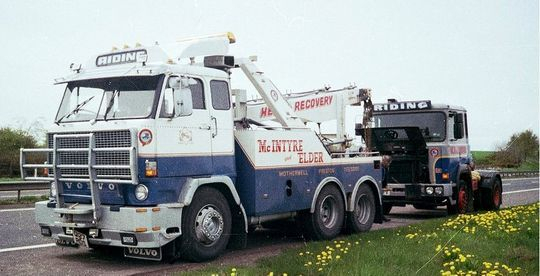 I brought the outfit back home and Tony came in my car he later set up his own haulage business that lasted a few years". Volvo F7 4X2 tractor unit Reg No PCW 446X 'Sir Lancelot' was one of four Volvo F7 tractor units which were purchased second hand off W.H. Bowker Ltd of Blackburn. 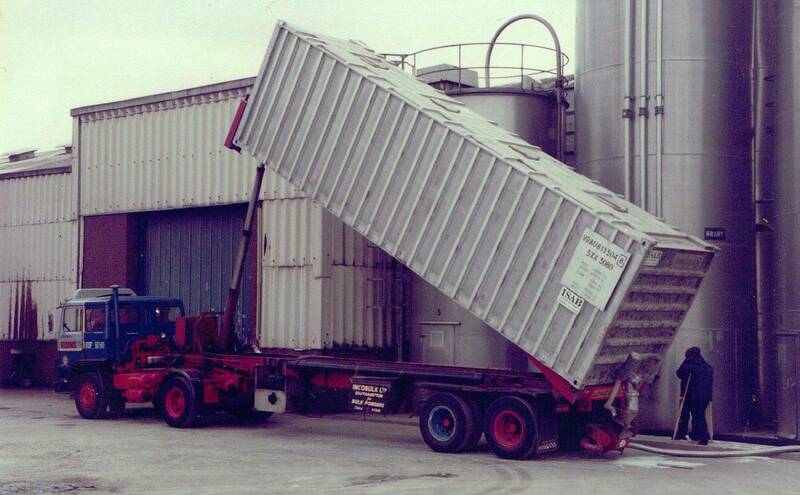 These vehicles were light and very quite so were used on a regular basis for discharging powder tanks when noise restrictions were in place at certain delivery locations. Based in Scotland this Volvo F88 double drive recovery vehicle was operated by Mcintyre & Elder and is seen here recovering one of the company's Seddon Atkinson tractor units on the M74 between Larkhall and Lesmahagow. "This Volvo F88 belonged to two fitters who were self employed but used my garage in Motherwell to do all my repairs and recovery as and when required. Above and beyond that they could do outside repairs so long as it didn't cause me any grief and it was a good arrangement which worked well".